"Rope installed for fish to 'climb'." Or click here to download a pdf of the article. "Recycling in Korokoro is a go!" It would be great to have a group of volunteers to help with the hunt and learn more about our local freshwater fish, so please come along if you're interested. We will begin at 3.30pm, to get the best of the low tide and light conditions. Wear gumboots. Children welcome if accompanied by an adult. Meet at Inanga Love Park on the banks of the lower reaches of the Korokoro Stream, between the railway bridge and the Hutt Road. Drop Daniel a line if you have any questions. If you commute into Wellington on the train and have a monthly pass, you can now ride the 154 bus service up and down the hill for free - just show your pass to the driver. (This isn't specific to the 154 service, you can ride most metlink services from zone 4 to the outer zone on your pass for free - see "MonthlyPlus pass - includes your train and bus trips"). The 154 now runs 12 times on Saturday at hourly intervals. Bruce Brewer, Animal Pest Control Officer from GWRC will be talking about and displaying some pest management options. Stuart Reid from Predator Free Normandale will be telling us about their experience of trapping on the hills. We will also be selling safe and effective traps at half-cost-price ($10.00 per trap, one per Korokoro resident or school family household). These traps are recommended by Hutt City Council/DOC, and have information about how to use them safely. (Please bring cash). Contact Julie for more information about this meeting. Thanks to all those who helped out our third working bee at Inanga Love Park on the banks of the lower reaches of the Korokoro Stream, and thanks also to Riba from Hutt City Council for all her support. Plenty of weeding, mulching and planting went on. Photos to follow. Everyone in New Zealand can get involved with the Great Kererū Count, whether you see any kererū or not, sharing your observations will help build up a clearer picture of where the kererū live, how many there are and what they are feeding on. 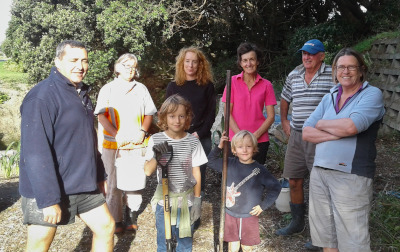 The Growing Places Trust and Keep Hutt City Beautiful are organizing cleaning and planting of the railway corridor. Starting at 10am at the Petone Station Platform. Finishing with lunch at Walter Nash Centre 12–1 pm. Bring yourself, friends, family aged 11+ wearing closed-toe sturdy footwear and trousers. If you have gardening gloves or high viz-vest, please bring them, but there will be spares. The Hutt Valley-Wellington Whaitua Committee, will be a group of local people tasked with researching and recommending tailored solutions for water issues in the catchment. Encompassing Hutt Valley, Makara, Wainuiomata, and Wellington City, the catchment is large and home to diverse communities with unique relationships to water. The committee will need public input to ensure the solutions they develop are going to work for our environment and all of those who call the whaitua home. So if you or someone you know who is passionate about safeguarding and restoring our waterways you may want to consider applying. There is plenty of information about what being a committee member would involve on the GWRC website. However, if you would like more of a personal perspective then contact Daniel who can put you in touch with a member of the Porirua Committee, which has been up and running for a couple of years. See the GWRC website for details of how to apply. Applications close 4th September. NZTA have issued an update on the proposed road. Inanga Love Park is where the Korokoro Stream passes under SH2 and the railway before entering the harbour. Many thanks to those who came and helped at our working bee. We did a lot of weeding and some planting. The following weekend our friends from the Growing Places Trust went back and did some more planting. We now need to plan a further working bee to paint the new mural, weed further and plant the additional plants that the Council are providing. After that we will have to sort out a regular schedule of light management in order to keep the weeds at bay. 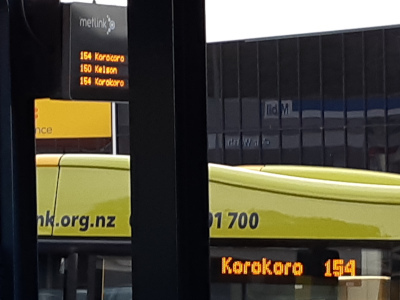 Korokoro now has a bus service on Saturdays! The 154 bus service now runs 12 times on Saturday at hourly intervals. A KEG meeting was held on Sunday 1st July. Read the minutes for details of what was discussed. Hutt City recently ran a consultation on its Long Term Plan for 2018–2028. Julie presented our submissions to the Mayor and Councillors at a public meeting in the Council Chambers on 16th May 2018. Thanks to the team of volunteers who have been helping to get the school garden in order. We held a working bee in late May to do some work on the new beds and put up a shade-house. Thanks for all those who have volunteered for this second working bee on the stream. A slight delay in sourcing new plants has meant that we have put this off until early June. Paul will be out this weekend with the team of volunteers, helping monitor mustelid, rodent and hedgehog numbers in Korokoro Valley. GWRC’s reports on the May pest monitoring in the region’s Key Native Ecosystems will go on up on the website when it is received. Lower Hutt Charity, the Common Unity Project, have agreed to come up to Korokoro in the next couple of weeks to check out a couple of sites to see if they are suitable for communal bee hives. In the event that they report on suitable sites we will discuss whether to support the Project and host the hives at the next KEG meeting. Before Christmas the latest NZTA evaluation into the P2G was published. Following the Kaikoura and Wellington earthquakes the evaluation report looked at resilience and the expected costs, benefits and environmental impacts. The project evaluation queried the resilience of the preferred option and suggested that costs would be much higher than first anticipated. It also highlighted that the environmental impacts could be difficult to mitigate. The good news is that the evaluation recommends abandoning the current route; the bad news is it recommends consideration of discarded options including that of using the Korokoro Valley as a route. KEG wrote to Minister Twyford in mid January 2018. We advocated that NZTA be steered towards more sustainable options, saying that there were good alternative ways of improving connectivity and calling on the minister to replace the discredited approach of tackling congestion through increased roading with a strategy that focusses on intelligent public and haulage transport, improved facilities for cycling and walking and public planning to reduce car use across the region. In early April the Minister responded. We encourage you to actively oppose building a road through the Korokoro Valley. As we head further into autumn we face the prospect of rubbish being blown all over Korokoro from open recycling bins. 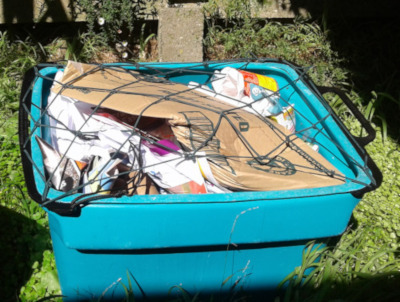 The solution is for as many people as possible to use the nets which go over the bins. The Council have kindly provided us with lots of nets, at a reduced rate. If you or your neighbours need any please contact Daniel Jones and we will drop some round. (A contribution of $5 per net to help us cover our costs would be appreciated). Volunteers from KEG, with help from the Growing Places charity, spent the afternoon of Sunday 1st April weeding, planting and tidying at Inanga Love Park, at the mouth of the Korokoro Stream. The Inanga Love Park was part of 2016 Common Ground Festival. It involved restoring the unloved section of the Stream between the culvert and the sea by removing the rubbish, establishing plant-cover to help spawning native fish and creating a series of posters about the stream and its ecology. The original plants did not thrive over the long, hot summer and the posters were starting to look tatty. So, we have cleared some weeds, done some more planting and taken the posters down. New posters are being created. Once they are ready we will put them up and continue with the planting. KEG had a stall at this year’s school gala to help raise money for the school, but we also helped reduce the waste created by the gala itself by organising compost and recycling bins and provide stall holders with suggestions for reusable/recyclable products and packaging. With plenty of people using the bins and a reduction in the use of plastics and clingfilm this was a big step in the right direction. It was not ‘zero waste’ but we now have enough know-how to help Home and School run a genuine zero waste event next time round. Four times each year KEG volunteers check pest monitoring tunnels in the Korokoro Valley and report results to Greater Wellington Regional Council. Korokoro Valley has been identified as one of several Key Native Ecosystems (KNE) in the Wellington Region. The Key Native Ecosystem programme aims to protect some of the best examples of native ecosystems in the Wellington region. It is working to achieve this by managing, reducing, or removing threats to their values. One of the primary threats to native plants and animals is introduced mammals, including rats and mustelids. Control of these pest animals is therefore undertaken at most KNE sites throughout the region. Regular monitoring is carried out to determine the effectiveness of these control efforts. The latest pest monitoring event was in February. For Belmont-Korokoro that showed that rat tracking rates were on target, mice tracking was low, mustelid tracking was absent, but Hedgehogs were up by 33%. For more details, read the latest small mammal monitoring report. A meeting about P2G and other matters was held at the end of January. Read the minutes for this meeting for more details. Thanks to the retiring committee members for their service. The full minutes are available from this website.